WARSAW — The Rodeheaver Series for the Performing Arts will host organist and pianist Aaron Tan in concert at 3 p.m. Sunday, Nov. 8, in the downtown sanctuary of First United Methodist Church of Warsaw. Aaron is a passionate organist, engineer and pianist. His primary musical tutelage has been under John Tuttle, David Palmer and Joel Hastings. 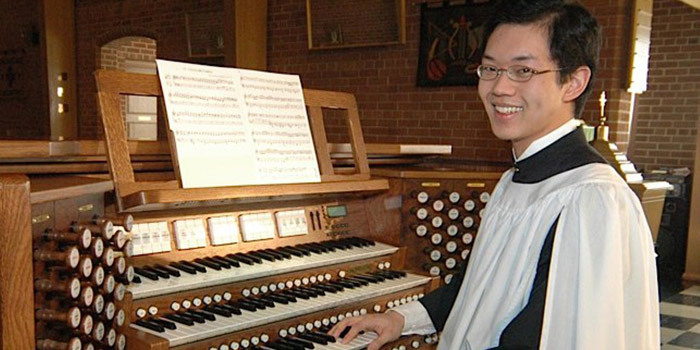 He has won numerous noteworthy contests and scholarships on both instruments including the Toronto RCCO Young Organists Competition, the Osborne Organ Competition of the Summer Institute of Church Music, the RCCO’s National Organ Playing Competition, the Charlotte Hoyt Bagnall Scholarship for Church Musicians, the Lilian Forsyth Scholarship, the West Chester University Organ Competition, the Arthur Poister Scholarship Competition and the XVI Poland International Piano Festival Competition. He is also a postdoctoral researcher in the University of Michigan’s Laboratory for Complex Materials and Thin Films Research, led by Peter Green. His current work focuses on developing techniques for measuring localized dielectric and thermal properties of polymer thin films. He recently completed a four-year position as Organ Scholar at St. John’s Episcopal Church in Detroit, Michigan, working with Huw Lewis. He is currently Artist in Residence at the Cathedral Church of St. Paul in Detroit. More information about Aaron’s musical interests and activities can be found at www.AaronTan.org. Admission to the concert is free, with donations to the series accepted. The church is accessible to the physically challenged. The Rodeheaver Series is named for the Rodeheaver family, legendary for their development and support of Christian music in the early 20th Century and members of First UMC. The Rodeheaver Series has been bringing the highest caliber of musical and theatrical artists to the area since its inception in 1990. Directions to the church, located at the northeast corner of Market and Indiana Streets, are available at www.RodeheaverSeries.org, or by calling the church office at (574) 267-6933.